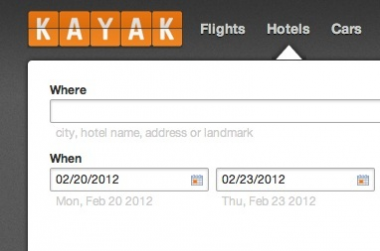 Travel comparison site Kayak.com has redesigned its Web site so it looks like its mobile app — not the other way around. “We run the iPhone and iPad teams separately from the Web team, and the Web team had fallen behind,” said Paul English, co-founder and CTO. The goal with the site’s design has always been to provide a simple layout, so that users can easily sift through thousands of flights, hotels and car rentals to find what they are looking for quickly. But up until now, the focus wasn’t really on being beautiful, English said. The new look tries to incorporate a clean and attractive design. After eight years in business, English said this is the most significant redesign of the site (check out the gallery below to see how the site has changed over the years). But only the most die-hard users are likely to notice many differences. Rather, the larger significance is that mobile is influencing the Web, and not the other way around. Increasingly, this may be the case in the travel industry as so much of the traffic now comes from phones and tablets. Kayak said more than five million applications were downloaded in the nine months ended in September, a 97 percent increase over the same period a year earlier. 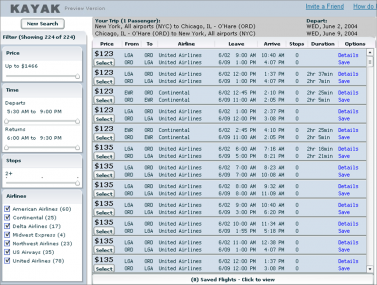 The unibrow is gone: Internally, the company refers to “the unibrow” as the black bar that stretched across the the top of the page that said “Search One and Done.” Now at the top of the screen are several tabs, such as Flights, Hotels, Cars, etc. Similar to iOS: The iPhone and iPad designers released a new iPad app about a month ago. In the new Web site design, they leaned on the design to bring a consistent typeface and coloring to the Web site. Most of the changes will go live today, with some of the others — like the new ad guidelines — taking more time to implement. English declined to provide an update on the company’s IPO. While it continues to file financial updates with the Securities and Exchange Commission, Kayak told AllThingsD in September that it was putting its plans on hold.